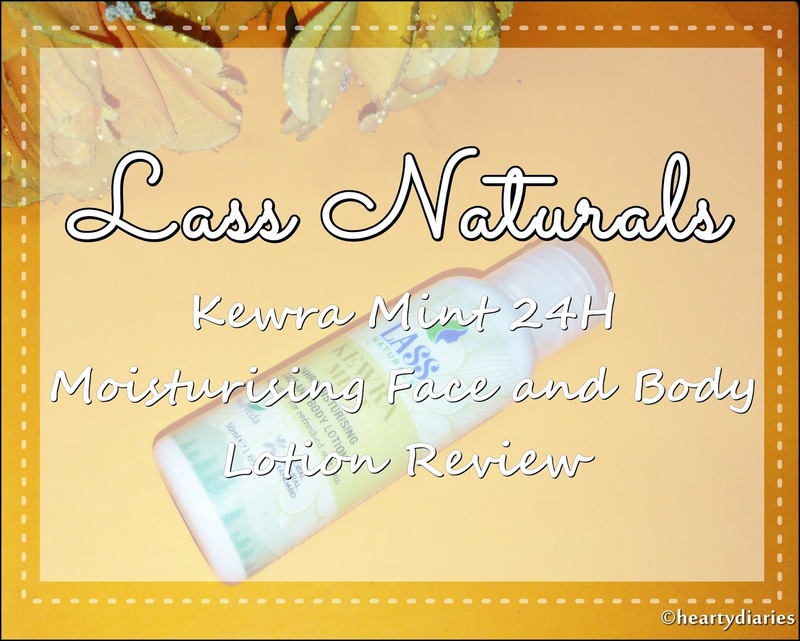 Lass Naturals is a brand that offers beauty products which are free from all harsh toxic synthetic chemicals and therefore suitable for all skin types. 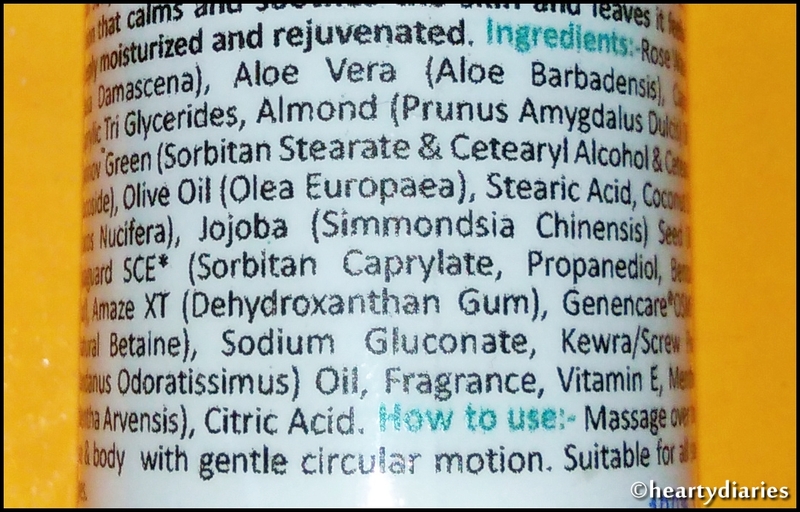 If interested, you can find there wide range of cruelty free products here.. Coming to this particular product, I had never heard of Kewra and Mint combination in a body lotion before and it intrigued me to try it as soon as I got it. According to the brand, this product enhances the summer glow by giving soft, refreshed skin. 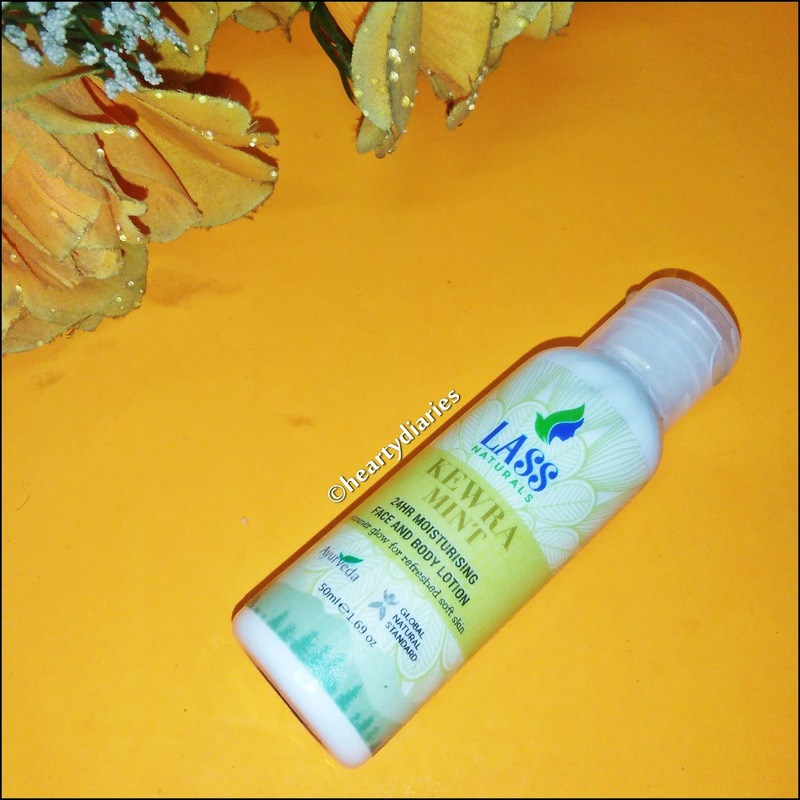 Since this lotion has such anti-inflammatory and soothing ingredients in it, I had quite high expectations with this it.. Please keep on reading this review till the end to find if this “new” combination worked for me or not.. Product Description: This non greasy formula absorbs quickly to leave skin soft, smooth and beautifully fragrant. The result is a lotion that calms and soothes the skin and leaves it feeling deeply moisturised and rejuvenated. How to Use: Massage over the face and body with gentle circular motion. Packaging: This body lotion comes in a transparent, plastic bottle and has a semi transparent, flip cap which locks pretty well. The bottle is compact, light weight, travel friendly, sturdy and leak proof. Smell: Just like Kewra/Screw Pine but if you have scented Sathritha shampoo ever in your life, I’d say it is exactly identical to it. Texture and Consistency: This lotion is white in color, has a rich and creamy texture while the consistency is more towards a runny side. My Experience: If you guys follow me on Instagram, you would know how bad my skin is behaving currently. If you don’t know, let me tell you what has happened. My skin was doing quite well for around a month and all of a sudden, a lot of painful, red acne showed up on my face recently. No matter what happens to my skin, I do not forget to moisturise it because it is very important to keep the skin moisturised to maintain the natural balance of the skin. Since I have excessively oily, acne prone and sensitive skin, I was really looking forward to this face and body lotion because of the cooling properties it claims to have. I take a very little product on my palm, rub it in between my fingers and gently massage it into my skin in circular motion. Although not every body would love this smell, I do because it is identical to sathritha which reminds me of my childhood. Also, the smell is not at all overpowering and disappears after a few minutes. 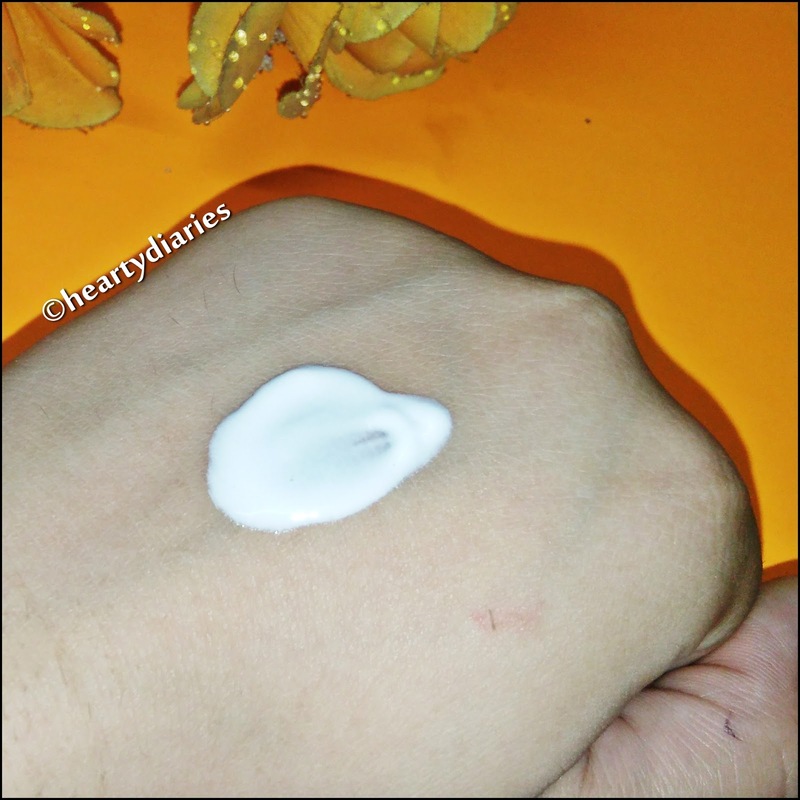 The texture of lotion is very non greasy and gets absorbed in to the skin within seconds. 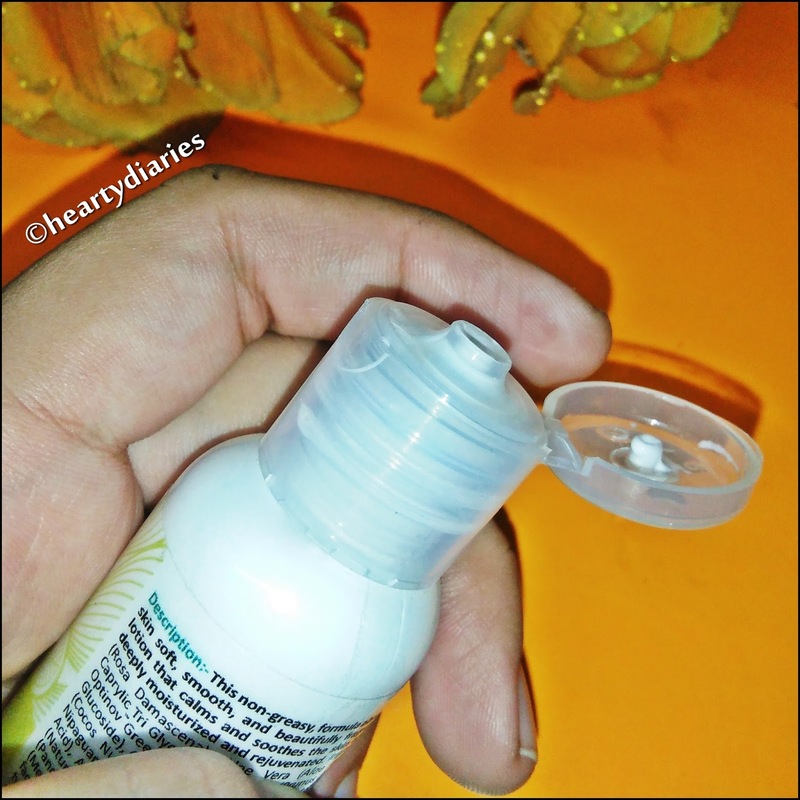 The only issue I faced with this product was that the bottle is made up of such hard plastic that it literally required quite a lot of effort to squeeze the product out of the bottle but the brand told me that the secret behind squeezing the bottle is in every bottle. There is a press or weak point and we need to press it from there and the cream will come out very easily. 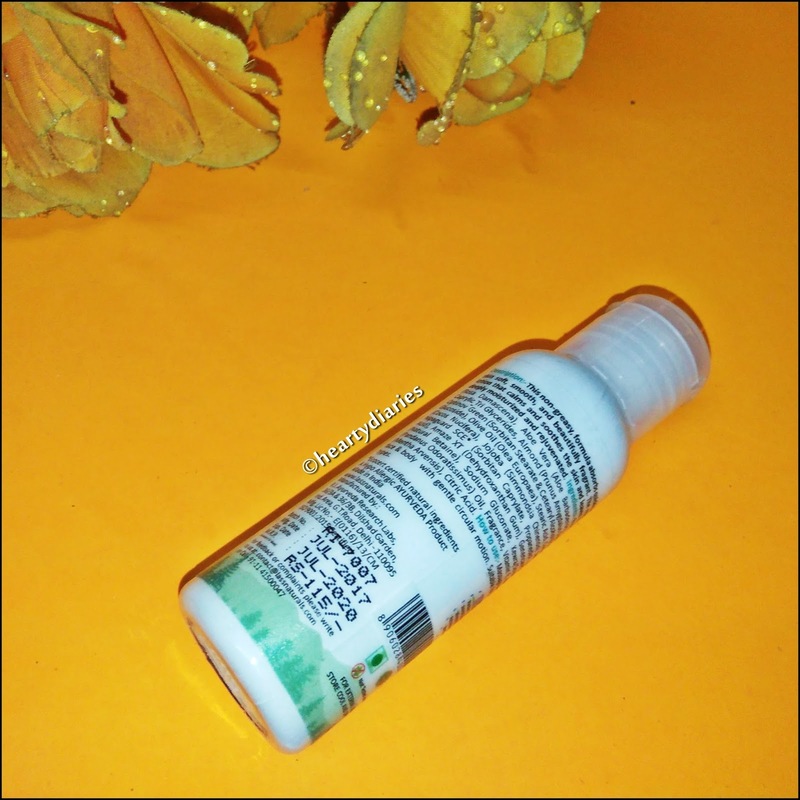 In this case, that weak point is in middle of front label (where product name and brand name is mentioned) and back label (directions and other information are mentioned). When I tried squeezing it as told by Lass Naturals, I was sorted and it came out quite easily. Application wise, this product is really good because it gets absorbed in to the skin instantly without leaving a shine. Since the ingredients have a cooling sensation and efficacy to them, they make my skin feel quite cool and refreshed. I have already told you guys in the Inveda D Tan Scrub Review about how much I love products that make my skin feel very cool and refreshed because I am a very sweaty person. Now talking about the result, I’d say this is a wonderful cruelty free moisturiser because it keeps the skin well moisturised the entire day as claimed. The formula is not at all greasy which I highly appreciate because I cannot take heavy creams or lotions on my face at all.. I must say I am very impressed by the ingredients list. Undoubtedly yes. I find this product worth purchasing because it lives up to its claims and is free from all kinds of harmful chemicals. If you are also a sweaty person like me or love products leaving cooling sensation on your face, go and grab this product. Actually you should go for it at-least once because it is cruelty free plus moisturises the skin quite well. Final Verdict: Overall, I’d say I am quite happy with the quality and effectiveness of this body lotion. It is rich but non greasy which I think is very good for people having excessively oily skin. Now that we are stepping into winters soon, I am really upset that I did not get to try it in summers when it was scorching… I love its smell, moisturisation, anti inflammatory properties and the fact that it is free from mercilessness. This really sounds wonderful and I love how affordable it is. Lovely review dear.. Would love to give it a tryy..
Looks like this brand has some amazing products. I am yet to try anything from this brand. Loved your review! Yeah! It is so soothing that I love it!!!! But my issue is thankfully solved now.. There is a press or weak point in every bottle and you need to press it from there and the cream will come out very easily. In this case, that weak point is in middle of front label (where product name and brand name is mentioned) and back label (directions and other information are mentioned)!